"Friedrich Wilhelm III" redirects here. For the 17th-century duke, see Friedrich Wilhelm III, Duke of Saxe-Altenburg. Frederick William III (German: Friedrich Wilhelm III) (3 August 1770 – 7 June 1840) was king of Prussia from 1797 to 1840. 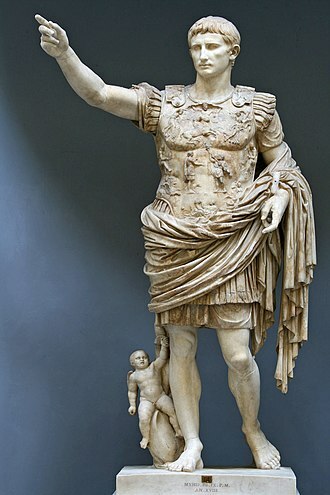 He ruled Prussia during the difficult times of the Napoleonic Wars and the end of the Holy Roman Empire. Steering a careful course between France and her enemies, after a major military defeat in 1806, he eventually and reluctantly joined the coalition against Napoleon in the Befreiungskriege. Following Napoleon's defeat he was King of Prussia during the Congress of Vienna, which assembled to settle the political questions arising from the new, post-Napoleonic order in Europe. He was determined to unify the Protestant churches, to homogenize their liturgy, their organization and even their architecture. The long-term goal was to have fully centralized royal control of all the Protestant churches in the Prussian Union of Churches. Frederick William was born in Potsdam in 1770 as the son of Frederick William II of Prussia and Frederica Louisa of Hesse-Darmstadt. He was considered to be a shy and reserved boy, which became noticeable in his particularly reticent conversations distinguished by the lack of personal pronouns. This manner of speech subsequently came to be considered entirely appropriate for military officers. He was neglected by his father during his childhood, and suffered from an inferiority complex his entire life. As a child, Frederick William's father (under the influence of his mistress, Wilhelmine Enke, Countess of Lichtenau) had him handed over to tutors, as was quite normal for the period. He spent part of the time living at Paretz, the estate of the old soldier Count Hans von Blumenthal who was the governor of his brother Prince Heinrich. They thus grew up partly with the Count's son, who accompanied them on their Grand Tour in the 1780s. Frederick William was happy at Paretz, and for this reason in 1795 he bought it from his boyhood friend and turned it into an important royal country retreat. He was a melancholy boy, but he grew up pious and honest. His tutors included the dramatist Johann Engel. As a soldier, he received the usual training of a Prussian prince, obtained his lieutenancy in 1784, became a lieutenant colonel in 1786, a colonel in 1790, and took part in the campaigns against France of 1792–1794. On 24 December 1793, Frederick William married Louise of Mecklenburg-Strelitz, who bore him ten children. 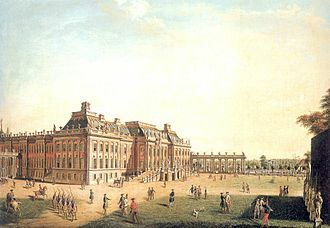 In the Kronprinzenpalais (Crown Prince's Palace) in Berlin, Frederick William lived a civil life with a problem-free marriage, which did not change even when he became King of Prussia in 1797. His wife Louise was particularly loved by the Prussian people, which boosted the popularity of the whole House of Hohenzollern, including the King himself. Lenient and slow to recognize the growing French threat, Frederick's restrained entry into the war in 1806 ended in national humiliation. Frederick William succeeded to the throne on 16 November 1797. He also became, in personal union, the sovereign prince of the Principality of Neuchâtel (1797–1806 and again 1813–1840). At once, the new King showed that he was earnest of his good intentions by cutting down the expenses of the royal establishment, dismissing his father's ministers, and reforming the most oppressive abuses of the late reign. He had the Hohenzollern determination to retain personal power but not the Hohenzollern genius for using it. Too distrustful to delegate responsibility to his ministers, he greatly reduced the effectiveness of his reign since he was forced to assume the roles he did not delegate. This is a main factor of his inconsistent rule. Every civil servant has a dual obligation: to the sovereign and to the country. It can occur that the two are not compatible; then, the duty to the country is higher. At first Frederick William and his advisors attempted to pursue a policy of neutrality in the Napoleonic Wars. Although they succeeded in keeping out of the Third Coalition in 1805, eventually Frederick William was swayed by the attitude of the queen, who led Prussia's pro-war party, and entered into war in October 1806. On 14 October 1806, at the Battle of Jena-Auerstädt, the French effectively decimated the effectiveness and functionality of the Prussian army led by Frederick William, and the Prussian army collapsed entirely soon after. Napoleon occupied Berlin in late October. The royal family fled to Memel, East Prussia, where they fell on the mercy of Emperor Alexander I of Russia. Alexander, too, suffered defeat at the hands of the French, and at Tilsit on the Niemen France made peace with Russia and Prussia. Napoleon dealt with Prussia very harshly, despite the pregnant Queen's personal interview with the French emperor which was believed would soften the blow of defeat. Instead, Napoleon took much less mercy on the Prussians than what was expected. Prussia lost many of its Polish territories, as well as all territory west of the Elbe, and had to finance a large indemnity and to pay for French troops to occupy key strong points within the Kingdom. Although the ineffectual King himself seemed resigned to Prussia's fate, various reforming ministers, such as Baron vom Stein, Prince von Hardenberg, Scharnhorst, and Count Gneisenau, set about reforming Prussia's administration and military, with the encouragement of Queen Luise (who died, greatly mourned, in 1810). In 1813, following Napoleon's defeat in Russia, Frederick William turned against France and signed an alliance with Russia at Kalisz, although he had to flee Berlin, still under French occupation. 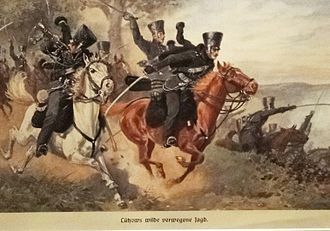 Prussian troops played a key part in the victories of the allies in 1813 and 1814, and the King himself travelled with the main army of Prince Schwarzenberg, along with Alexander of Russia and Francis of Austria. At the Congress of Vienna, Frederick William's ministers succeeded in securing important territorial increases for Prussia, although they failed to obtain the annexation of all of Saxony, as they had wished. Following the war, Frederick William turned towards political reaction, abandoning the promises he had made in 1813 to provide Prussia with a constitution. Frederick William was determined to unify the Protestant churches, to homogenize their liturgy, their organization and even their architecture. The long-term goal was to have fully centralized royal control of all the Protestant churches in the Prussian Union of churches. 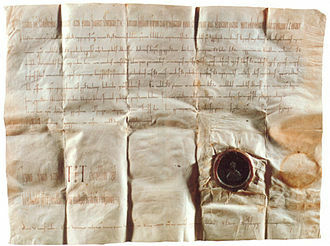 In a series of proclamations over several years the Church of the Prussian Union was formed, bringing together the majority group of Lutherans, and the minority group of Reformed Protestants. The main effect was that the government of Prussia had full control over church affairs, with the king himself recognized as the leading bishop. 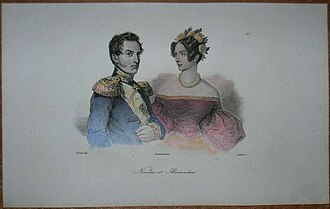 In 1824 Frederick William III remarried (morganatically) Countess Auguste von Harrach, Princess of Liegnitz. They had no children. In 1838 the king distributed large parts of his farmland at Erdmannsdorf Estate to 422 protestant refugees from the Austrian Zillertal who built Tyrolian style farmhouses in the Silesian village. Frederick William III died on 7 June 1840 in Berlin, from a fever, survived by his second wife. His eldest son, Frederick William IV, succeeded him. 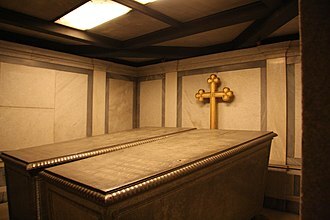 Frederick William III is buried at the Mausoleum in Schlosspark Charlottenburg, Berlin. Frederick William IV of Prussia 15 October 1795 2 January 1861 married Elisabeth Ludovika of Bavaria (1801–1873), no issue. William I, German Emperor 22 March 1797 9 March 1888 married Augusta of Saxe-Weimar-Eisenach (1811–1890), had issue. Prince Charles of Prussia 29 June 1801 21 January 1883 married Princess Marie of Saxe-Weimar-Eisenach (1808–1877), had issue. Princess Alexandrine of Prussia 23 February 1803 21 April 1892 married Paul Friedrich, Grand Duke of Mecklenburg-Schwerin (1800–1842), had issue. Princess Louise of Prussia 1 February 1808 6 December 1870 married Prince Frederik of the Netherlands (1797–1881), had issue. 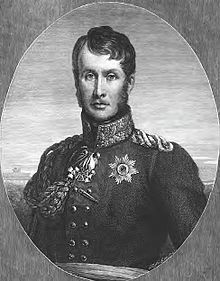 Prince Albert (Albrecht) of Prussia 4 October 1809 14 October 1872 married Princess Marianne of the Netherlands (1810–1883), had issue; married second to Rosalie von Rauch (1820–1879), Countess of Hohenau, had issue. ^ vgl. Franz Blei: Königin Luise von Preußen. In: Gefährtinnen. 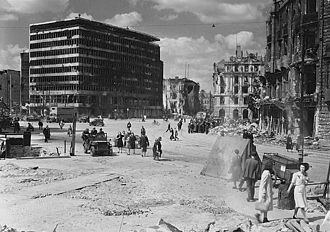 Berlin 1931, S. 68 f.
^ Encyclopaedia Britannica, The Editors of (30 July 2018). "Federick William III". Encyclopaedia Britannica. ^ a b c Feldhahn, Ulrich (2011). 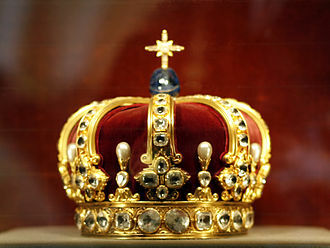 Die preußischen Könige und Kaiser (German). Kunstverlag Josef Fink, Lindenberg. pp. 17–20. ISBN 978-3-89870-615-5. Carsten Peter Thiede, Eckhard G. Franz: Jahre mit Luise von Mecklenburg-Strelitz. Archiv für hessische Geschichte und Altertumskunde Bd. 43. Darmstadt 1985. Auguste von Harrach, was the second spouse of King Frederick William III of Prussia. Since the marriage was morganatic, she was not named Queen, Frederick reportedly stated, that he did not wish to have another queen after his first one. Auguste was the issue of Count Ferdinand Joseph von Harrach of Rohrau and she met Frederick on a spa in Teplitz in Bohemia in 1822. Auguste and Frederick married at Charlottenburg Palace 9 November 1824, as Auguste was a Catholic and a non-royal, the marriage was initially kept a secret. In many quarters the marriage was greeted with surprise and some initially refused to believe it. 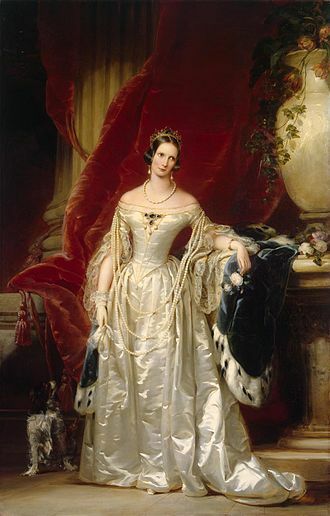 The Princess of Liegnitz converted to Protestantism in 1826, Auguste was put more or less outside the protocol in the court life of Berlin, she ranked after all the princes and princesses of the royal family. She was not politically active and had no children and she nursed Frederick when he died in 1840, but was not allowed to attend the funeral. Auguste was given an allowance and allowed to continue to live in the royal palace as a widow. Potsdam is the capital and largest city of the German federal state of Brandenburg. It directly borders the German capital Berlin and is part of the Berlin/Brandenburg Metropolitan Region and it is situated on the River Havel,24 kilometres southwest of Berlins city centre. 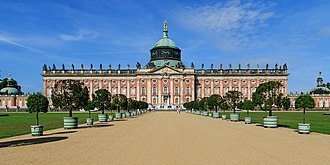 Potsdam was a residence of the Prussian kings and the German Kaiser, around the city there are a series of interconnected lakes and cultural landmarks, in particular the parks and palaces of Sanssouci, the largest World Heritage Site in Germany. The Potsdam Conference in 1945 was held at the palace Cecilienhof, the Filmstudio Babelsberg is the oldest large-scale film studio in the world. Potsdam developed into a centre of science in Germany in the 19th century, there are three public colleges, the University of Potsdam, and more than 30 research institutes in the city. The area was formed from a series of large moraines left after the last glacial period, the city is three-quarters green space, with just a quarter as urban area. 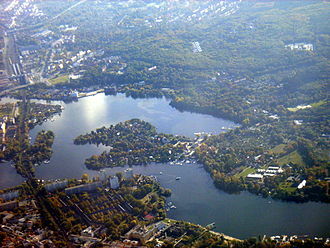 There are about 20 lakes and rivers in and around Potsdam, such as the Havel, the Griebnitzsee, Templiner See, Tiefer See, Teltowkanal, Heiliger See, the highest point is the 114-metre high Kleiner Ravensberg. Potsdam is divided into seven city districts and nine new Ortsteile. The appearances of the city districts are quite different, the districts in the north and in the centre consist mainly of historical buildings, the south of the city is dominated by larger areas of newer buildings. Potsdam has an Oceanic climate, with cool, snowy winters, the average winter high temperature is 3.5 °C, with a low of −1.7 °C. Snow is common in the winter, summers are mild, with a high of 23.6 °C and a low of 12.7 °C. 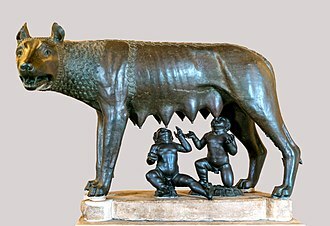 The name Potsdam originally seems to have been Poztupimi, a common theory is that it derives from an old West Slavonic term meaning beneath the oaks, i. e. the corrupted pod dubmi/dubimi. The area around Potsdam shows occupancy since the Bronze Age and was part of Magna Germania as described by Tacitus. The German Campaign was fought in 1813. This was the factor in the outbreak of the German Campaign the following year. The Spring Campaign between members of the Sixth Coalition and the First French Empire ended inconclusively with a summer truce. Via the Trachenberg Plan, developed during a period of ceasefire in the summer of 1813, in the following Autumn Campaign, Austria eventually sided with the coalition, thwarting Napoleons hopes of reaching a separate agreement with the major powers Austria and Russia. 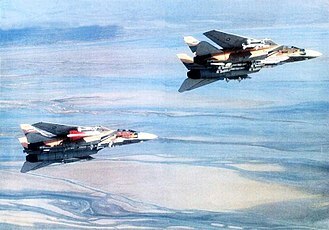 The Coalition allies now had a numerical superiority, which they eventually brought to bear on Napoleons main forces. 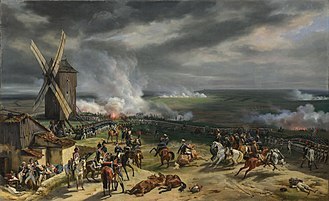 The high point of allied strategy was the Battle of Leipzig in October 1813 and this completely broke Napoleons power to the east of the river Rhine. Napoleon was forced to abdicate and Louis XVIII regained the French Throne, the war came to a formal end with the Treaty of Paris in November 1814. They advocated limitations to the princes of Germany and a joint effort by all Germans to eject the French. 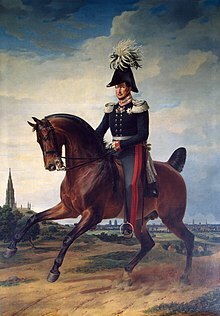 From 1810 Arndt and Jahn asked high-ranking figures in Prussian society again and again to prepare such an uprising, Jahn himself organised the German League and made a major contribution to the founding of the Lützow Free Corps. These forerunners took part in the outbreak of hostilities in Germany, even before the German Campaign, there had been uprisings against the French troops occupying Germany – these had broken out from 1806 onwards in Hesse and in 1809 in the Tyrolean Rebellion. These uprisings intensified in the year under Wilhelm von Dörnberg, the initiator and commander-in-chief of the Hessian uprising. This was the factor in the outbreak of the German Campaign the following year. On 17 March 1813 – the day Alexander I of Russia arrived in the Hoflager of Frederick William III of Prussia – Prussia declared war on France. On 20 March 1813 the Schlesische privilegierte Zeitung newspaper published Fredericks speech entitled An Mein Volk, delivered on 17 March and calling for a war of liberation. Although not the first of its kind, the Prussian Union was the first to occur in a major German state. It became the biggest independent religious organisation in the German Empire and Weimar Germany, the church underwent two schisms, due to changes in governments and their policies. After being the state church of Prussia in the 19th century, it suffered interference and oppression at several times in the 20th century. In the course of the Second World War, Church property was damaged or destroyed by strategic bombing. After the war, complete ecclesiastical provinces vanished following the flight, the two post-war periods saw major reforms from within the Church, strengthening the parishioners democratic participation. In the early 1950s the Church body was transformed into an umbrella, following the decline in number of parishioners due to the German demographic crisis and growing irreligion, the Church was subsumed into the Union of Evangelical Churches in 2003. The many changes in the Church throughout its history are reflected in its name changes. 20 November 1934 –1945, The Evangelical Church of the old-Prussian Union, two church bodies–one Nazi-recognised and one gradually driven underground–each claimed to represent the true church. 1945–1953, The Evangelical Church of the old-Prussian Union partially cleansed its leading bodies from German Christians and appointed Nazi opponents, 1953–2003 Evangelical Church of the Union, an independent ecclesiastical umbrella among other recognised Protestant umbrellas and church bodies. 2004 The Evangelical Church of the Union merged in the Union of Evangelical Churches and their descendants made up the bulk of the Calvinists in Brandenburg. At issue over many decades was how to unite into one church, the king, a Reformed Christian, lived in a denominationally mixed marriage with the Lutheran Queen Louise, which is why they never partook of the Lords Supper together. A commission was formed in order to prepare this common agenda, Major reforms to the administration of Prussia were undertaken after the defeat by Napoléons army at the Battle of Jena-Auerstedt. Frederick William II was King of Prussia, from 1786 until his death. He was in personal union the Prince-elector of Brandenburg and sovereign prince of the Canton of Neuchâtel, pleasure-loving and indolent, he is seen as the antithesis to his predecessor, Frederick II. 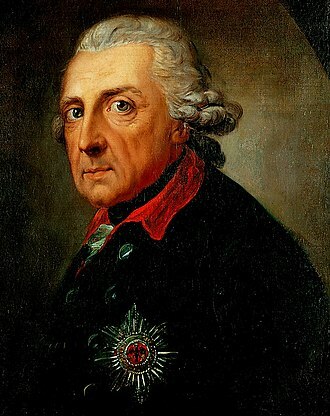 Under his reign, Prussia was weakened internally and externally, and his religious policies were directed against the Enlightenment and aimed at restoring a traditional Protestantism. 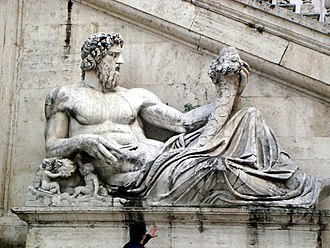 However, he was a patron of the arts and responsible for the construction of notable buildings. 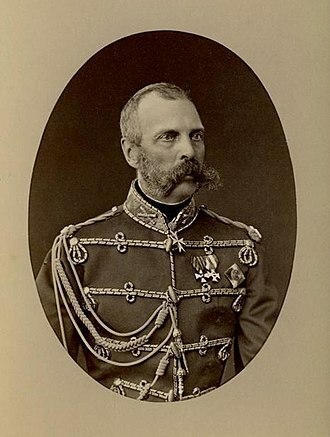 Frederick William was born in Berlin, the son of Prince Augustus William of Prussia and his mothers elder sister, was the wife of Augustus Williams brother King Frederick II. Frederick William became heir-presumptive to the throne of Prussia on his fathers death in 1758, the boy was of an easy-going and pleasure-loving disposition, averse to sustained effort of any kind, and sensual by nature. His marriage with Elisabeth Christine of Brunswick-Lüneburg, daughter of Charles I, Duke of Brunswick-Lüneburg and he married Frederika Louisa of Hesse-Darmstadt, daughter of Ludwig IX, Landgrave of Hesse-Darmstadt on 14 July 1769 in Charlottenburg. He was a talented cellist, for his part, Frederick William, who had never been properly introduced to diplomacy and the business of rulership, resented his uncle for not taking him seriously. The misgivings of Frederick II appear justified in retrospect, Frederick William terminated his predecessors state monopolies for coffee and tobacco and the sugar monopoly. However, under his reign the codification known as Allgemeines Preußisches Landrecht, initiated by Frederick II, on 26 August 1786 Wöllner was appointed privy councillor for finance, and on 2 October 1786 was ennobled. Though not in name, he in fact prime minister, in all internal affairs it was he who decided. Bischoffswerder, still a major, was called into the king′s counsels. From this position Wöllner pursued long lasting reforms concerning religion in the Prussian state, the king proved eager to aid Wöllners crusade. On 18 December 1788 a new law was issued, to secure the orthodoxy of all published books. This forced major Berlin journals like Christoph Friedrich Nicolais Allgemeine Deutsche Bibliothek, people like Immanuel Kant were forbidden to speak in public on the topic of religion. Frederick William IV, the eldest son and successor of Frederick William III of Prussia, reigned as King of Prussia from 1840 to 1861. In politics, he was a conservative, and in 1849 rejected the title of Emperor of the Germans offered by the Frankfurt Parliament as not the Parliaments to give, in 1857, he suffered a stroke and was left incapacitated until his death. Born to Frederick William III by his wife Queen Louise, he was the favourite son. Frederick William was educated by tutors, many of whom were experienced civil servants. He gained experience by serving in the Prussian Army during the War of Liberation against Napoleon in 1814. In 1823 he married Elisabeth Ludovika of Bavaria, since she was a Roman Catholic, the preparations for this marriage included difficult negotiations which ended with her conversion to Lutheranism. There were two wedding ceremonies—one in Munich, and another in Berlin, the couple had a very harmonious marriage, but childless. 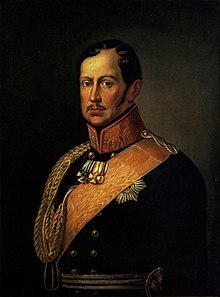 Frederick William opposed the idea of a unified German state, believing that Austria was divinely ordained to rule over Germany, Frederick William became King of Prussia on the death of his father in 1840. Through a personal union, he became the sovereign prince of the Principality of Neuchâtel. In 1842, he gave his fathers menagerie at Pfaueninsel to the new Berlin Zoo, despite being a devout Lutheran, his Romantic leanings led him to settle the Cologne church conflict by releasing the imprisoned Clemens August von Droste-Vischering, the Archbishop of Cologne. He patronized further construction of Cologne Cathedral, Cologne having become part of Prussia in 1815, in 1844, he attended the celebrations marking the completion of the cathedral, becoming the first king of Prussia to enter a Roman Catholic building. He committed himself to German unification, formed a government, convened a national assembly. Once his position was more secure again, however, he quickly had the army reoccupy Berlin and in December dissolved the assembly, Frederick William would only accept the imperial crown after being elected by the German princes, as per the former empires ancient customs. 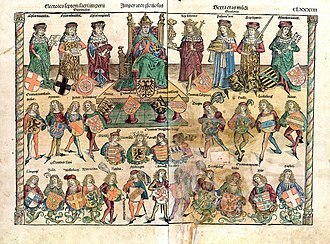 In the kings eyes, only a reconstituted College of Electors could possess such authority, with the failed attempt by the Frankfurt Parliament to include the Habsburgs into a newly unified German Empire, the Parliament turned to Prussia. Paretz is a village in the German state of Brandenburg in the district of Havelland, west of Berlin. Recently, a reform made Paretz into a borough of the city of Ketzin. It has a population of approximately 400, in the late 18th and early 19th centuries the village was the summer residence King Frederick William III of Prussia and of his wife Queen Louise. The manorial estate of Paretz was originally property of the von Bredow family from whom, in 1677 and it was from here that his daughter Wilhelmina eloped with Ernst Christian von Weiler, a married man, in 1689. The estate was inherited by Count Hans von Blumenthal, former commander of the Gardes du Corps, the Crown Prince had a sad childhood, but he was always happy staying with his tutor at Paretz. For this reason, in 1795 he bought the estate of Paretz from his tutors son, his former playmate Count Heinrich von Blumenthal, the Berlin architect David Gilly was put in charge of the construction of the building and it was planned to become a country palace. Just remember always that you are building for a poor farmer, flanking the palace were placed two barn buildings each, on the left and right, thus forming a semi circular yard. In 1804 the royal couple had the village rebuilt to conform to David Gillys designs. After the death of Queen Louise in 1810 the palace was left unchanged until 1840 when Frederick William IV had the wallpaper, the appeal of the Schloss-Still-im-Land was lost however and the palace remained untouched and empty until early in the 20th century. The palace continued to be owned by the Hohenzollern until 1945, in 1888 Prince Heinrich took over the palace and his wife Princess Irene of Hesse and by Rhine continued after his death in 1929. In April 1945 the Red Army took possession of the grounds, a year later, refugees moved into the buildings and in 1948 ownership of the palace was transferred to the Zentrale Verwaltung der gegenseitigen Bauernhilfe. Modifications to the complex through 1950 completely changed the look of the palace, special attractions of the palace are the tapestries that are adorned with exotic plant motives, bird renditions and depictions of landscapes in the Potsdam area. Duchess Louise of Mecklenburg-Strelitz was Queen consort of Prussia as the wife of King Frederick William III. The couples happy, though short-lived, marriage produced nine children, including the future monarchs Frederick William IV of Prussia and she was already well loved by her subjects, but her meeting with Napoleon led Louise to become revered as the soul of national virtue. Her early death at the age of thirty-four preserved her youth in the memory of posterity, the Order of Louise was founded by her grieving husband four years as a female counterpart to the Iron Cross. In the 1920s conservative German women founded the Queen Louise League, Duchess Luise Auguste Wilhelmine Amalie of Mecklenburg-Strelitz was born on 10 March 1776 in a one storey villa, just outside the capital in Hanover. She was the daughter and sixth child of Duke Charles of Mecklenburg and his wife Landgravine Friederike of Hesse-Darmstadt. 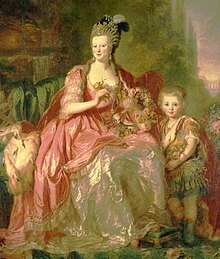 At the time of her birth, Louises father was not yet the ruler of Mecklenburg-Strelitz, and consequently she was not born in a court, the family subsequently moved to Leineschloss, the residence of Hanoverian kings, though during the summer they usually lived at Herrenhausen. Louise was particularly close to her sister Frederica, who was two years younger, as well as with their only brother George and her siblings were under the care of their governess Fraulein von Wolzogen, a friend of their mothers. After Duchess Charles death, the family left Leineschloss for Herrenhausen, Duke Charles remarried two years to his first wifes younger sister Charlotte, producing a son, Charles. Louise and her new stepmother became close until Charlottes early death the year after their marriage, the twice widowed and grieving duke went to Darmstadt, where he gave the children into the care of his mother-in-law and Louises godmother, the widowed Landgravine Marie Louise. Their grandmother preferred to raise them simply, and they made their own clothes and she received religious instruction from a clergyman of the Lutheran Church. Complementary to her lessons was an emphasis on charitable acts, and Louise would often accompany her governess when visiting the houses of the poor and needy. Louise was encouraged to give out as much as was in her means, from the age of ten until her marriage at 17, Louise spent most of her time in the presence of her grandmother and governess, both well-educated and refined. Louise loved history and poetry, and not only enjoyed reading Schiller, in 1793, Marie Louise took the two youngest duchesses with her to Frankfurt, where she paid her respects to her nephew King Frederick William II. Louise had grown up into a young woman, possessing an exquisite complexion and large blue eyes. Louises uncle, the Duke of Mecklenburg, hoped to strengthen ties between his house and Prussia, consequently, on one evening carefully planned by the Duke, seventeen-year-old Louise met the kings son and heir, Crown Prince Frederick William. The crown prince was twenty-three, serious-minded, and religious and she made such a charming impression on Frederick William that he immediately made his choice, desiring to marry her. Frederica caught the eye of his younger brother Prince Louis Charles and Louise were subsequently married on 24 December that same year, with Louis and Frederica marrying two days later. Princess Charlotte of Prussia with her groom, Grand Duke Nicholas Pavlovich of Russia during their wedding, 1817. 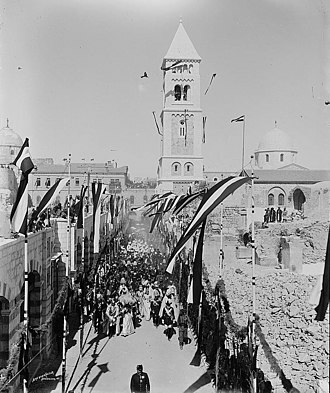 King William II of Prussia, then Supreme Governor of the Evangelical Church of Prussia's older Provinces, and Queen Augusta Victoria after the inauguration of the Evangelical Church of the Redeemer in Jerusalem (Reformation Day, 31 October 1898). Battle of Leipzig. Painting by Alexander Sauerweid. Battles of the German Campaign inscribed on a medal. The Lützow Free Corps in action. 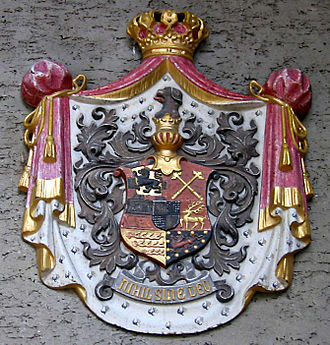 Arms granted to Ludwig I von Blumenthal in 1701 and (below) to Hans and Joachim von Blumenthal in 1786, upon Hans being elevated to a Count (Graf). Note that here the vine is planted, not couped.